When Iron Council was published, I thought I had a handle on what kind of writer China Miéville was. While the themes of the three novels set in the Bas-Lag universe varied (as did their quality), they had such a distinctive voice that people essentially used them to define the “New Weird” subgenre. That King Rat had a somewhat different feel was noted, but that was a first novel, written when Miéville was quite young (although, incredibly, he was only 28 when Perdido Street Station was published…not written, mind you, published). I haven’t read Un Lun Dun yet, but I gather it was a departure, but it was a YA novel so some changes were understandable. But with The City & the City, there finally could be no mistake: Miéville isn’t content to settle down and churn out similar books. I think this is fantastic, incidentally, and it means I am always interested in his work. However, it also means that just because you liked one of his books, you can’t count on liking the rest. For my part, I really liked Perdido Street Station, absolutely loved The Scar, was disappointed by Iron Council, and felt The City & the City was an interesting failure. That brings us to Kraken. The title refers to a giant squid kept on exhibit at a London museum. One day this prize specimen is stolen and the biologist who was responsible for studying it finds himself investigated by the police, named as the prophet of a cult of squid-worshipers, and pursued by a mostly disembodied underworld kingpin. It seems that the secret magic-using underground of London feels the squid is the foundation of an onrushing apocalypse, but no one knows how or why. In the course of discovering the truth behind these strange events, the protagonist and the reader are taken on a whirlwind tour of this shadow London. As you can probably tell from my synopsis, this is an urban fantasy novel. To put it a little more crudely, I think this is Miéville trying to write a Neil Gaiman novel. Like Neverwhere, the normal everyday guy protagonist finds himself pulled into a parallel London where the supernatural is commonplace. Like American Gods, the novel’s metaphysics seems oriented roughly around the idea that believing something exists gives it some degree of power and even agency, even if it doesn’t (or at least didn’t previously) actually exist. Having already stated my feelings about previous Miéville novels, I guess I should now declare my position on the relevant portions of Gaiman’s work: I really liked Neverwhere and have reread it several times, but American Gods left me cold and I haven’t revisited it. 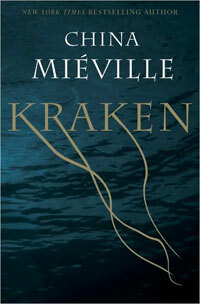 Kraken is about the end of the world and the feelings of unease and eventually despair that precede it, but despite this it is the least serious of Miéville’s novels (at least of those I’ve read, namely all of them except Un Lun Dun, although King Rat was quite a long time ago at this point). It couldn’t be more different than The City & the City in this respect. That novel was grim and unrelentingly focused on its one central idea. Kraken is light hearted and, while it never strays too far from how immanent the apocalypse is, veers wildly from one conceptual sidetrack to another. I suppose this is the China Miéville version of a fun and accessible novel, although this is still Miéville so it never quite abandons traces of horror and his characteristic dense prose. But is it any good? Well, it’s pretty good. I think most would agree Miéville’s strongest asset is his formidable imagination and here he gives it free reign to populate London’s theological underworld with all manner of bizarre cults, weird creatures, and unusual magic. He never nails down any rules to the magic being used, and while that weakens the ending slightly, it means he can have people invoke magic in all sorts of different ways. The light tone gives him a chance to deploy a variety of jokes and puns, and while these are of course hit and miss they are, on the whole, an asset. However, for me Kraken fell short of the mark it was aiming for. Part of the problem may be with me as a reader. Many characters in Kraken speak in British slang dialects that, as an American, were a little difficult to parse. It’s not that I didn’t know what was going on, but I think a lot of lines intended to be humorous fell flat for me because I was spending too much time decoding the slang. British readers and others more familiar with the London vernacular will probably have a better experience. Along similar lines, I thought the depiction of London was lacking, but my experience of the city is unfortunately limited to Heathrow airport, so scenes set by unexplained reference were lost on me. Throughout the novel, however, the world building felt shallow and a little flimsy. There wasn’t a sense, as there was in Neverwhere, that this secret London could possibly coexist with the real thing. Neverwhere‘s London Below was safely out of sight and its interactions with the mundane world were mediated by homeless people, whereas there’s no metaphysical division between Miéville’s two Londons. The police are part of the real police force, the organized crime seems like it’s supposed to be like mundane criminal organizations, and everyone else just uses the occasional glamor to prevent anyone from noticing their unusual activities. How does all this work? Does Baron write reports to senior management like an ordinary officer? Does the Tattoo’s gang sell drugs and bankroll extortionate loans? For such a long novel…far longer, if I’m not mistaken, than Neverwhere…very few such questions are ever answered. The characters are an even bigger problem. The protagonist, Billy Harrow, is nice enough, but seems inadequately motivated for the difficulties and extreme dangers to which he subjects himself. He tells Dane that he wants revenge for Leon’s death, but he otherwise almost never mentions Leon. He constantly wants to get word to Leon’s girlfriend who he barely knows, but doesn’t seem to think his family might want to know as well. Marge, meanwhile, accepting that Leon is dead, quits her job and immerses herself in the London underworld to…well, by her own admission, she doesn’t know what she wants to accomplish. Dane at least has very understandable motivations throughout, but I had a different problem with him: I just didn’t buy him as a cultist. In fact, this is a problem with all of Miéville’s cultists. They’re people like you and me, just trying to get through the day, it’s just that when they go home they worship a giant squid, or something even less likely. The absurdity of an upper middle class Londoner kneeling before a giant squid beak is humorous, but it’s humorous because it’s out of place. In interviews Miéville identifies as an atheist, and I guess to him believing in virgin birth or reincarnation is just as fanciful as his squid cult. But there’s an important difference: established religions have the weight of tradition and, to varying degrees, society behind them. Giant squid do not. That doesn’t mean no one would worship a giant squid, but it does mean that someone who would do so has fallen pretty far out of step with society, to the point they really aren’t like you and me any more. There’s a reason cults keep their members sequestered and radicalized. Of course, Miéville actually takes his cults-as-normal conceit a step further and has them all mix and associate. So not only do these cultists pass as normal in London society without difficulty, they interact with each other the same way rival political activists might: they argue, they share drinks, they make temporary alliances, and occasionally come to blows. Again, this seems like a misunderstanding of how cults view the world, or else, more likely perhaps, just a failure to apply any real-world psychology to the setting. If all that wasn’t enough, there’s still one final barrier to making sense of Miéville’s cults: magic. At first, it might seem like this would make cults more likely. After all, instead of being stuck with mere rhetoric and charisma, a would-be cult leader can in fact perform supernatural feats to convince people to sign up. But the magic depicted in the novel is ubiquitous. You can’t walk five feet without seeing teleportation, a talking animal, or else people using Jedi powers. Somehow all of this is shrouded from mundane London, but once pierced the curtain falls away entirely and every magic user sees everything that’s happening around them. Since there seem to be no rules to the operation of this magic, everyone accepts that virtually anything is possible if someone is powerful or clever enough. All this seems very difficult for a cult worldview to integrate, given they must assert that they alone have access to truth and power. Surely the response to all this ill-defined magic is not faith but science? The scientist-thaumaturge protagonist of Perdido Street Station seems like a better fit than cultists like Dane. This becomes particularly glaring at the very end of the book (if you are spoiler-averse you should skip this paragraph). For the ending to work, we have to believe several very outlandish things. First, we are asked to believe that removing Darwin would prevent evolution from ever being discovered, which is nonsense. Maybe the idea of evolution will be permanently blocked somehow, but this isn’t consistent with how the time fire was shown to work. Second, with no supporting material since his character was a cipher up until the final scene, we are told that the villain is a former creationist who, believing now in evolution, nevertheless wants to fool everyone into being creationists. I guess most readers won’t have a problem with that, but I needed a lot more reasons to buy it. Fundamentalism stems from the enlightenment and is motivated by, almost to the point of obsession, a belief in absolute truth. It would make more sense for the villain to try to create the God of his childhood, but this would highlight another weakness of the setting: if believing in things give them power, shouldn’t the major world religions be producing effects infinitely more powerful than tiny cults and minor criminals? The last issue, and perhaps the most odd, is way the book takes it for granted that eradicating knowledge of evolution somehow equates to the end of the world. Billy Harrow is a biologist and can be forgiven for feeling this way, but everyone else in the London underworld, including everyone who predicted a horrifying apocalypse, has almost no connection with science and seem unlikely to miss it. If this was Star Trek-style history manipulation then you could make the case that changing something so far back on the timeline would basically wipe out everyone alive today, but the history changes depicted in the book seem to work by altering the present rather than the actual past. Kraken was an enjoyable read, but I felt that almost every facet of the story, from character to plot to world building, didn’t quite add up. I’m glad that Miéville is trying different things, though, rather than sticking with the “brand” that made his name. Apparently his next novel is a space opera, and I can’t wait to see what he does with it. great write up! Even though you weren’t in love with Kraken, you told me why, and I appreciate that. I’ve read a lot of reviews, both good and bad, but haven’t read the book yet, so I did skip your spoiler paragraph. If I do get to Kraken, it’ll be a library book. I too consider myself a huge fan of China Mieville, but I think need to start saying I am a huge fan of some of his stuff, because although The Scar and Iron Council are two of my favorite books of all time, Perdido, The City and the City, and King Rat were just OK for me. Un Lun Dun tho, is very much Mieville trying to do Gaiman YA, it reads a little like Coraline, and is very cute. A great chapter book for parents to read to their children at bedtime, and a fun little read for grown ups too. Funny, I had the exact same impression (http://dfan.org/blog/2010/06/22/china-mieville-kraken/), that this was sort of a Neil Gaiman – parody? – let’s say homage, and as such it didn’t really work for me. My opinions of other Mieville are similar to but not quite the same as yours; on your scale I’ll say Perdido Street Station 4, The Scar 5, Iron Council 1 (gave up 1/4 through), The City & the City 4, Kraken 3, Embassytown 4.